Rodes's and Johnson's Division Ewell's Corps were at Carlisle. Jenkins's Cavalry Brigade was sent to reconnoitre the defenses of Harrisburg. Early's Division Ewell's Corps marched from Berlin by way of Weiglestown to York. Gordon's Brigade Early's Division marching on through York to Wrightsville on the Susquehanna River. Hill's corps in camp at Fayetteville. Longstreet's Corps at or near Chambersburg. Hampton's, Chambliss's and Fitz Lee's Brigades Stuart's Division marched via Darnestown and Rockville, MD. Erected by Gettysburg National Military Park Commission. Location. 39° 49.639′ N, 77° 14.685′ W. Marker is near Gettysburg, Pennsylvania, in Adams County. Marker is on West Confederate Avenue, on the right when traveling south. Touch for map. Located near the Shultz Woods in Gettysburg National Military Park, across the street from the National Guard Armory. Marker is in this post office area: Gettysburg PA 17325, United States of America. Touch for directions. 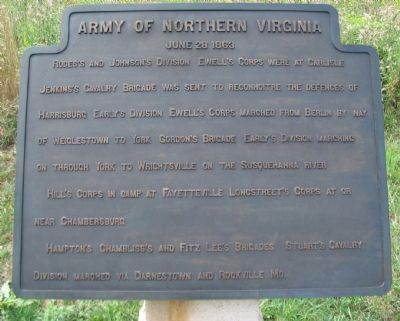 Ten tablets cover the movements of the Confederate army from June 26 to July 5, 1863.
named Army of Northern Virginia (here, next to this marker); a different marker also named Army of Northern Virginia (here, next to this marker); a different marker also named Army of Northern Virginia (here, next to this marker); a different marker also named Army of Northern Virginia (here, next to this marker); a different marker also named Army of Northern Virginia (a few steps from this marker); a different marker also named Army of Northern Virginia (a few steps from this marker); a different marker also named Army of Northern Virginia (a few steps from this marker). Touch for a list and map of all markers in Gettysburg. More about this marker. 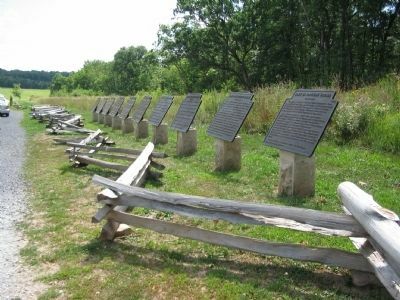 The tablet is one of ten placed originally by the Battlefield Commission around the turn of the century. These were restored and placed on Seminary Ridge in 2007. More. Search the internet for Army of Northern Virginia. Credits. This page was last revised on June 16, 2016. This page originally submitted on September 27, 2008, by Craig Swain of Leesburg, Virginia. This page has been viewed 733 times since then and 7 times this year. Photos: 1. submitted on September 27, 2008, by Craig Swain of Leesburg, Virginia. 2. submitted on September 25, 2008, by Craig Swain of Leesburg, Virginia.